The Jersey breed originated on the Island of Jersey, a small British island in the English Channel off the coast of France. The Jersey is one of the oldest dairy breeds, having been reported by authorities as being purebred for nearly six centuries. The breed was known in England as early as 1771 and was regarded very favorably because of its milk and butterfat production. At that early date, the cattle of Jersey island were commonly referred to as Alderney cattle although the cattle of this island were later referred to only as Jerseys. 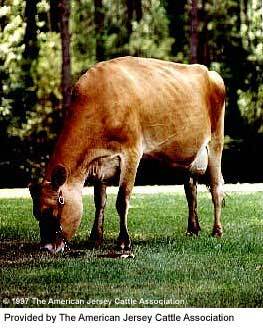 Jersey cattle were brought to the United States in the 1850's. 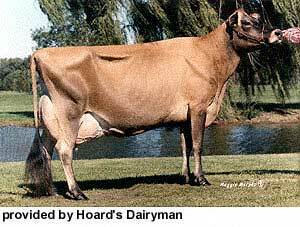 Adaptable to a wide range of climatic and geographical conditions, outstanding Jersey herds are found from Denmark to Australia and New Zealand, from Canada to South America, and from South Africa to Japan. They are excellent grazers and perform well in intensive grazing programs. They are more tolerant of heat than the larger breeds. With an average weight of 900 pounds, the Jersey produces more pounds of milk per pound of body weight than any other breed. Most Jerseys produce far in excess of 13 times their bodyweight in milk each lactation. The modern Jersey breed is unexcelled in dairy type. Breeders in the United States commonly referred to two distinct types of Jerseys in the past, these being the Island and the American; this distinction is not commonly made at present. It should be recalled that this is a different usage of the word "type" than is usually implied and refers to the general size and quality of the animal rather than to its use for dairy purposes. The Island-type Jerseys excelled in refinement and those qualities that were deemed necessary to win in the show ring. Refinement and beauty of such cattle in mature form led to the marked superiority of cattle imported from the island of Jersey or their direct descendants in winning most of the major awards of the American show ring. The so-called American-type Jerseys were noted much more for production than for beauty. Cattle referred to by this description are usually larger, a bit coarser, and have been bred for years for those qualities that suit them for milk and butterfat production. Some have referred to them as the "Farmer's" Jersey. Usually after two or three generations in the United States in the hands of the ordinary feeder, the refinement of the Island cattle gives way to the larger and less refined American kind. In recent years there has been less concern about these type variations; no doubt the program of type classification has tended to reduce the extremes. Additional emphasis on milk production and less stress on butterfat production had, no doubt, resulted in general acceptance of Jersey cows with more size and scale. Recent importations of Jerseys have consisted of larger cattle than many previously brought to the United States. Their offspring have not only been acceptable in type but have also been used advantageously in improving production. Cows show very marked refinement about their heads and shoulders, carry long, straight top lines, and usually carry out long and level at the rump. For their size, they are usually deep in the body and full and deep in the barrel. There is no more appealing dairy animal than the well-balanced Jersey cow, and although usually somewhat more nervous in disposition than the other dairy cows, she is usually docile and rather easy to manage. Jersey cows usually have an extreme weight range of between 800 and 1200 pounds, but medium-sized cows are usually preferred. Jersey bulls, while small as compared to the other dairy breeds, are extremely masculine. They are quite muscular about their crests and shoulders and are considerably less refined throughout than are the females. The same general qualities of straight lines and diary conformation as are found in the cows are desired in bulls. They usually range in weight from 1200 to 1800 pounds, but as in the females, medium weights are usually preferred. Jersey bulls are known for having the least docile temperament of the common breeds of cattle. It is folly to trust any dairy bull and particularly Jerseys past eighteen months of age. Modern Jerseys may be of a wide range in color. There is little preference today between the solid and broken colors although most breeders slightly prefer the cattle with an unbroken color pattern. Most prefer the dark tongue and switch, but this is more a matter of an identification point than a point of discrimination. The color in Jerseys may vary from a very light gray or mouse color to a very dark fawn or a shade that is almost black. Both the bulls and females are commonly darker about the hips and about the head and shoulders than on the body. Most breeders slightly prefer the medium shades of color to the extremes, but nearly all of them realize that type and producing ability are far more important than the shade of color or whether the color is solid or broken.